The unofficial battle for leadership of District 32-6A took place last Friday as the Greyhounds varsity football team faced off against the Brownsville Hanna Golden Eagles at a home conference game. Both teams were undefeated 2-0 in district play, but after Friday night’s game, Hanna stands at 3-0 to the Greyhounds’ 2-1 in district play. Despite some solid runs, such as a 22-yard run by Smiley Silva as quarterback and a 17-yard run by Brandon Valadez, the numbers did not play in favor for the ’Hounds, who totaled 96 yards compared to the Eagles’ 342 yards. 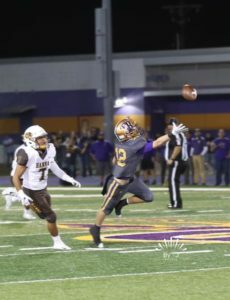 San Benito also scored only 119 rushing yards compared to the Hanna’s 255: Hanna running back Cesar Mancias ran 24 times for a total of 105 yards while QB Victor Campos rushed three touchdowns, earning Hannah the victory of 30-0 by the end of the night. Greyhound hopes were still high by the end of the first half since the score totaled 7-0, though various penalties and failures at getting through the Eagles’ defensive line during the first half foreshadowed the imminent challenges from the opponents. During the third quarter, the Eagles had scored on their first two drives, bumping their score up to 16-0 by the end of the quarter. During the fourth quarter, the Greyhounds ran what appeared to be a 67-yard touchdown by Brandon Valadez, a much needed performance boost, but was instead dismissed due to a holding penalty. By the end of the fourth quarter, Hanna had scored two more touchdowns, both by QB Victor Campos, ending the score at 30-0. Two games remain in the regular season. San Benito faces Rivera this week Thursday night at 7 p.m. in an away conference game.